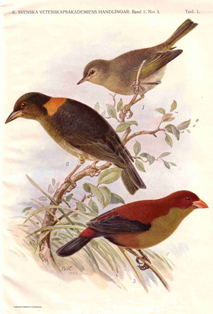 The Golden-naped Weaver was first described in 1920 by Sassi, based on specimens from Beni-Mawambi und Ukaika, Democratic Republic of Congo. The specimens were collected by Rudolf Grauer in 1910. 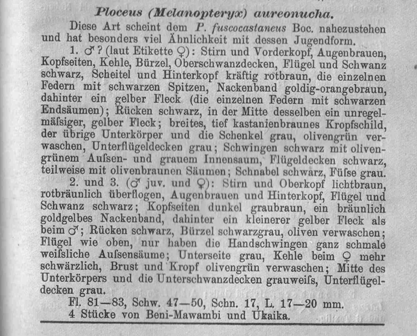 The first illustration of the Golden-naped Weaver was published in Gyldenstolpe 1924. Identification and sexing: The male is black with a red-brown crown, yellow collar on the nape, maroon breast and white undertail coverts. The female is duller. This species has been recorded in Ituri Forest, DRC, and Semliki NP, Uganda. A list of all sightings is listed below. Add your own Golden-naped Weaver colony - see Weaver Watch project, although no breeding records exist yet.